HINDU RITUALS AND ROUTINES...: !! 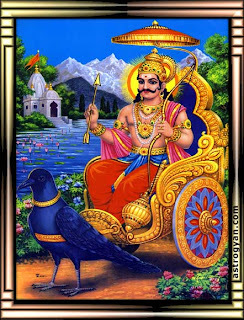 Shri Shani Katha !! is black clothing allowed in lord shani temple? yes u can wear black clothes in shani temple there is no problm at all ..n please its a request to all the people's of india n the whole world that the lord shani dev is a friend not a enemy. people have there different opinions but i felt he has the power to give everything which u required. he punished cheater's.n he gives all his blessing to honest peoples n he always help him. if you realy want to know more about lord shani dev than i must say u shuld come once at shanidham in chatterpur mehroli.thankyou. He has broken down me like anything. I do not think that he knows to make anything. I used to worship hi but now i feel that he is not worth worshiping. I am under shani dhaiya, he has ruined me & there are no chances for me to stand up with dignity. Do you have any scriptural source to back your story about Shiva & Shani dev, or is it just rumour kind of story? Which chapter of which Puran has this story? Is red cloth good for offering to Lord Shani?